"It has been a more successful show than ever", says Rosa Eskelund of Roses Forever. Last month, they attended the IPM Essen and with their enlarged booth in the new hall, they attracted the attention of many. The scented roses took center stage and by running a competition they now know which of their new scented potted rose varieties in their 'Love Fragrance Forever' line had the best scent. Harley, Anders and Rosa Eskelund at the IPM Essen 2019. The brand new series of fragrant pot roses ‘Love Fragrance Forever’ attracted a lot of attention. "It became a success, already the first day. Everyone liked them and everyone put their nose in it", Rosa laughs. And by putting their nose in the varieties and by voting which variety you liked the most, one could have a shot at winning an iconic wooden Kaj Bojesen figure. "The week after the IPM Essen, we counted the votes of each of the three varieties we had on display. And funnily, the variety that won the IPM public's choice award was also voted the best fragrant variety at our booth." Even though the scented pot and garden roses took center stage, the Roses Forever booth was large enough to show all of their product groups, namely the 3 series in their mini pot roses (Infinity, Roses Forever and Love Fragrance Forever), 3 series in garden roses (Plant’n’relax, Sweet Home Roses, and Plant’n’cut), the cut rose series Rosa Loves me and the Gourmet roses. On top of that, the booth still had room to show new codes and how to mix their products. The new colours to the Infinity series was shown to the licensed growers, both the new ‘Lemon Grass Infinity’ (on the left) and a upcoming Green one (on the right). The week after the IPM Essen, Roses Forever also invited their licensed and new growers to their company in Denmark where growers could see where the varieties are bred and trialled. 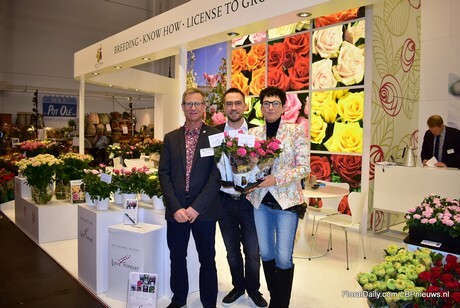 If you missed the Roses Forever booth at the IPM Essen, no worries. 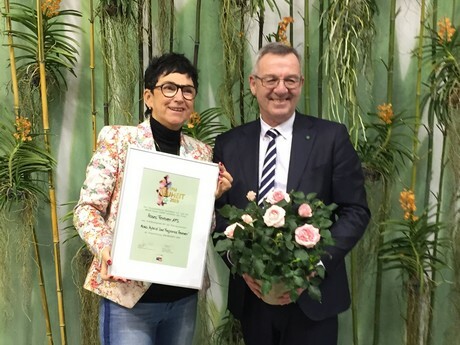 They will again be presenting their roses at the FlowerTrials in June, the IFTF in November and of course again at the IPM Essen 2020.